This group of plates is found North of New Zealand, enclosed by the Australian plate and the Pacific plate. Before the formation of the plates, the region used to be a subduction zone where the Pacific plate was subducting under the Australian plate. This formed the, now below sea level, Lau-Havre island arc. 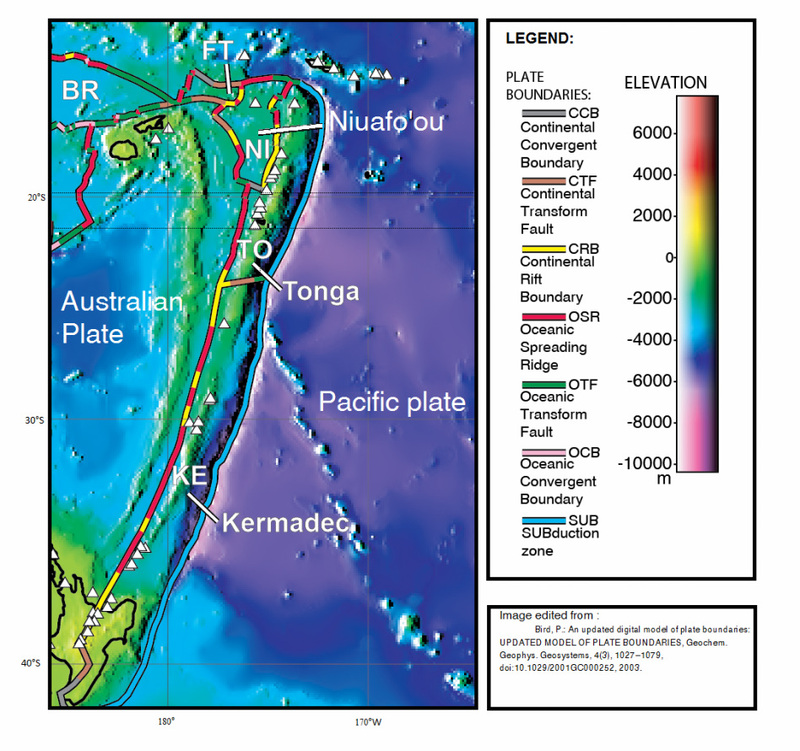 The Niuafo’ou micro-plate is located west of the Tonga plate. It is bounded to the east by its spreading center with Tonga, but lack a defined border with Tonga in the southeast (Zellmer and Taylor, 2001). The Pacific plate is subducting under it to the North. To the southwest, it is bounded by the Australian plate with which it shares a spreading center at the south of the boundary and a transform zone to the Northwest. Finally, it shares a spreading center with the Futuna plate to the west . The Kermadec plate comprises of the northeastern part of New Zealand, and it extends north all the way to the southern part of the Tonga plate. It is bounded by the Kermadec Trench on the eastern side, where the Pacific subducts under the Kermadec plate. To the West it is bounded by a spreading center with the Australian plate. To the north, it has a transform zone with the Tonga plate. During the Pliocene the Pacific plate was subducting beneath the Australian plate (Gill, 1976). This produced the Lau-Colville Ridge, a now extinct volcanic arc that starts from the North tip of Tonga, and ends at the northern tip of New Zealand. Around 6 Ma ago, the region started to undergo crustal extension, which this led to the creation of the Tonga-Kermadec Ridge plate through the separation of the Tonga-Kermadec ridge from the Lau-Colville Ridge with the Lau Spreading Center in the back arc, separating the Tonga and the Lau Ridges, and the Havre through separating the Kermadec and the Colville Ridges (Smith and Price, 2006). The northern basin, (Lau Basin) is much wider than the southern one (Havre Basin), due to the rate of spreading variying from 96mm/year in the north to 39mm/year in the South (Martinez et al., 2006). This coincides with the rate of subduction of the Pacific plate to the west, which varies from 24cm/year in the North to 6cm/year in the South. This difference in movement rates led the Tonga Plate to separate from the Kermadec; they are separated by a transform zone. The rapid extension of the Lau basin led to many small spreading center; the Niuafo’ou micro-plate was formed by this in the northwestern part of the Tonga plate (Zellmer and Taylor, 2001). The Euler pole of the Kermadec plate relative to the Australian plate motion is found just a little south of where the plate boundary hits the land; this means that unlike the northern part of the plate, the southern tip of the Kermadec plate is colliding with the Australian plate. (Zellmer and Taylor, 2001),(Wallace et al., 2004). At the same latitude, you have the Pacific plate is subducting under the eastern side of the island,resulting in convergent boundaries on both sides. To the south west, the Australian plate subducting under New Zealand, which creates interesting features in the south of the island. Notice the width of the Lau Basin in the NE compared to the Havre trough in the SW. Image from (Zellmer and Taylor, 2001). Motion of the GPS station on North Island, New Zealand, relative to the Australian plate. Error ellipses are at 68% confidence level. Image from (Wallace et al., 2004). Smith, I. E. M. and Price, R. C.: The Tonga–Kermadec arc and Havre–Lau back-arc system: Their role in the development of tectonic and magmatic models for the western Pacific, J. Volcanol. Geotherm. Res., 156(3–4), 315–331, doi:10.1016/j.jvolgeores.2006.03.006, 2006. Bird, P.: An updated digital model of plate boundaries: UPDATED MODEL OF PLATE BOUNDARIES, Geochem. Geophys. Geosystems, 4(3), 1027–1079, doi:10.1029/2001GC000252, 2003. Gill, J. B.: Composition and age of Lau Basin and Ridge volcanic rocks: Implications for evolution of an interarc basin and remnant arc, Geol. Soc. Am. Bull., 87(10), 1384–1395, doi:10.1130/0016-7606(1976)87<1384:CAAOLB>2.0.CO;2, 1976. Martinez, F., Taylor, B., Baker, E. T., Resing, J. A. and Walker, S. L.: Opposing trends in crustal thickness and spreading rate along the back-arc Eastern Lau Spreading Center: Implications for controls on ridge morphology, faulting, and hydrothermal activity, Earth Planet. Sci. Lett., 245(3–4), 655–672, doi:10.1016/j.epsl.2006.03.049, 2006. 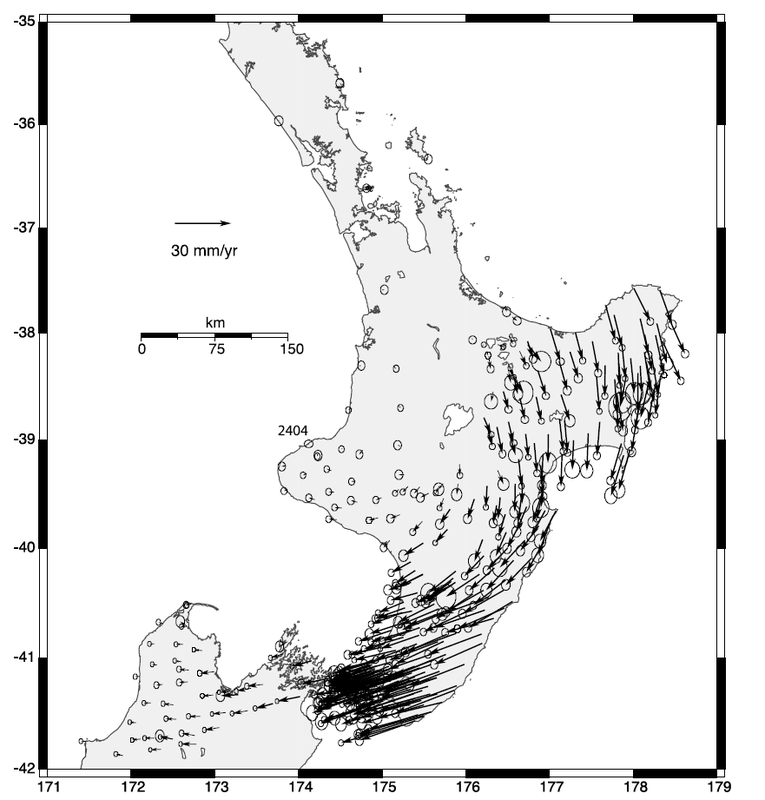 Wallace, L. M., Beavan, J., McCaffrey, R. and Darby, D.: Subduction zone coupling and tectonic block rotations in the North Island, New Zealand, J. Geophys. Res. Solid Earth, 109(B12), doi:10.1029/2004JB003241, 2004. Zellmer, K. E. and Taylor, B.: A three-plate kinematic model for Lau Basin opening, Geochem. Geophys. Geosystems, 2(5), doi:10.1029/2000GC000106, 2001.